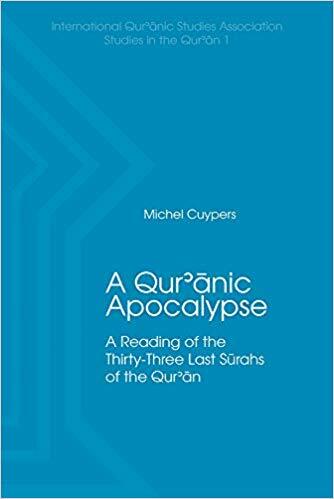 Michel Cuypers, A Qurʾānic apocalypse: A reading of the thirty-three last Sūrahs of the Qurʾān, Atlanta: Lockwood Press, 2018, 384 pages (collection “International Qurʾānic Studies Association, Studies in the Qurʾān”, 1). The present volume closes a trilogy devoted to the exegesis of the Qurʾān analyzed according to the principles of Semitic rhetoric, a method of textual analysis developed in the field of biblical studies. It studies the shortest sūrahs of the Qur’ān, which are traditionally dated to the beginnings of the preaching of Muḥammad in Mecca. The reference to the initial vision of Muḥammad in Sūrah 81, the point of departure for his career as Prophet, provides the starting point of the study of this group of sūrahs. The analysis shows that the redactors who assembled the textual fragments of the Qurʾān into a book were guided by precise intentions. In the end, it is these intentions that the rhetorical analysis of the text enables us to discover and better understand. This entry was posted in Publications and tagged Cuypers by Iman. Bookmark the permalink.